Medicinal uses: Flower heads and volatile oils used to externally treat slow healing wounds, burns, dry skin, eczema, oral thrush, and hemorrhoids. Taken internally as anti-inflammatory to treat mouth and throat ailments. Improves digestion, stimulates bile production, heals gastric ulcers, and regulates menstrual disorders (Chevallier 73). Additional uses: The flowers are edible and can be added as a garnish to any food. If dried and ground the flowers can be used as a coloring substitute for saffron or turmeric. 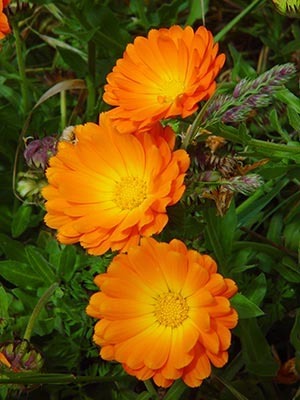 Calendula can also be used as a dye plant and to bring out highlights in the hair of brunettes and blondes (Kowalchik 62). Cautions: None known (Chevallier 73).